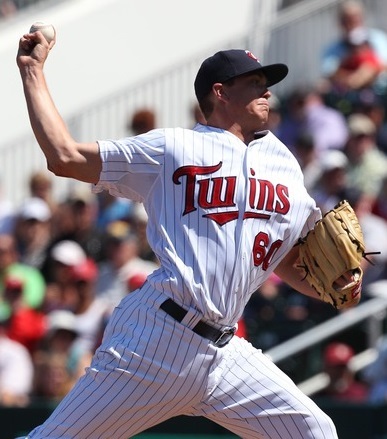 Kyle Gibson was drafted by the Minnesota Twins in the 1st round of the 2009 draft. Since the draft, things haven’t gone as planned for Gibson, as although his stats have been decent, he hasn’t been able to stay completely healthy; having to undergo Tommy John surgery in September of 2011. As far as Gibson’s stats go, he’s certainly lived up, for the most part, to being a first round draft pick. The 2008 Team USA pitcher went 11-6 with a 2.96 ERA in his first professional season, in 2010. Good enough to earn him a promotion to AAA Rochester at the end of the year, after beginning the season with A+ Fort Myers. Gibson’s stellar inaugural season didn’t translate into 2011, however, as although he was selected to participate in the All-Star Futures Game, at Chase Field, Gibson went 3-8 on the year, with a 4.18 ERA. To put it in simpler terms: That’s not very good. But Gibson’s poor pitching wasn’t entirely his fault. Gibson had an arm injury, which resulted in him having to have Tommy John surgery during the offseason. A surgery that would turn out to be a blessing in disguise for Gibson. Post surgery, Gibson had a sudden boost in velocity, as his fastball rose from upper 80’s to lower 90’s, this past season. In Gibson’s most recent (partial) season, he went 0-2 with a 9.45 ERA; which is misleading due to the few innings in which he was able to pitch. As a result of the shortened season, Gibson traveled out to Arizona to participate in the Arizona Fall League, where he was selected to make the start for the Western Division in the 2012 A.F.L. Rising Stars Game–lasting two innings and giving up a couple of runs. As long as things continue to go smoothly for Gibson, between now and the start of the season, barring any unpredicted setbacks, you can expect to see Gibson in the Major Leagues sometime during the upcoming 2013 season; if not on Opening Day. He certainly has the potential to get the call up out of Spring Training, and as such, is a guy everyone needs to keep a very close eye on in the coming months. 1.) At what age did you first become interested in baseball? Who was your biggest baseball influence growing up? I have always been involved and interested in baseball because my dad was. He was a high school baseball coach after he played a little bit of junior college baseball in his prime. He still likes to play in a mens senior league to this day. I believe that is why he would be my biggest influence on my love for the game up to this point. 2.) Who was your favorite baseball player growing up? Why? I had a couple when I was growing up. My dad was a huge Nolan Ryan fan, so obviously I thought he was cool, but believe it or not, I used to play a little short stop in my younger/shorter/faster years, and at that time Barry Larkin was a favorite player of mine as well. 3.) You were drafted by the Twins in the 1st round of the 2009 draft. What was that process like for you? Where were you when you first found out? Initial thoughts? The process was a long and stressful process at times mainly because I found out I had a stress fracture in my right forearm about 4 days before the draft. That made everything a little more stressful than I imagined, but even with that said, it was a fun process and I learned a lot. My parents and I decided to stay home and invite some people over to the house to watch the draft, so I was sitting outside in our driveway under a tent with what ended up being a few more people than the “some” we had planned on inviting. Everyone was getting a little anxious because from everything we had heard there was no definite place I was going to get drafted. So as the picks went by we got a little more anxious, but when my name was called there was a loud cheer, and I still get chills thinking about that moment in my life. 4.) You had Tommy John surgery in September of 2011 and seemed to have an increase in velocity. Has that increase in velocity changed the way you go about pitching or did you keep the same basic approach? It does not change the way I pitch too much, other than the fact that I now have a much different fastball and slider. I have needed to learn to trust my fastball a little more because it’s now consistently in the low 90’s where before I was more consistently 89. My slider has also gained some velocity and has sharpened up a bit, so I have needed to adjust to that as well. 5.) Is there any one stat that you pay attention to throughout the season? Or do you try to steer clear of them altogether? I would say there are a couple stats that I like to look at, and those are walks and ground ball/fly ball ratio. I hate walking people, so that is why that is so important to me, and I also know that when I am at my best, I need to have the defense involved. The best way for me to do that is to get lots of ground balls and allow our infielders to do the rest. 6.) You made the start for the West division in the 2012 Arizona Fall League Rising Stars Game. What was that experience like, in terms of going up against some of the best hitters that minor league baseball has to offer? That experience was a lot of fun. Had I not given up a moonshot to the first batter I might have enjoyed it slightly more…..just kidding. It was a great opportunity, even though for only 2 innings, to square off against [Jarred] Cosart, who I have known for many years dating back to when he had committed to Missouri out of high school before the Phillies drafted and signed him. It was a lot of fun for all of us, and good to get that chance to pitch another time against the best the minors has to offer. 7.) What are your plans for the remainder of the offseason to help you prepare for 2013? What are your goals for 2013? Since my regular season extended into my offseason more than usual, I am now starting to get back into the swing of things and throwing again. Workouts will get more intense as I make sure my arm and body are prepared for another long season. My goals have a lot to do with staying healthy, and hopefully making it up to the big club and having a positive impact on our chances of winning. Everyone wants to become a big leaguer, and I really hope I am able to do that this year. ‘Sports Center’ or ‘Duck Dynasty’. Steak or Mozzi’s Pizza from Greenfield, Indiana where I grew up. 10.) Lastly, what advice would you give to kids who are just starting out that dream of playing professional baseball one day? Always have fun. Baseball should be something that they enjoy doing. Work as hard as you possibly can. I always look back and know that I could have worked harder because I never really knew what it took to become a professional. So have no regrets and work as hard as you can, but have fun doing it! Big thanks to Kyle Gibson for taking the time to answer my questions. This entry was posted in Dailies and tagged AFL, Arizona Fall League, Baseball, Futures Game, Kyle Gibson, MiLB, MLB, Rising Stars Game, Team USA, Twins by Matt Huddleston. Bookmark the permalink. Great interview. It seems like I am finding more and more blogs that are like mine.